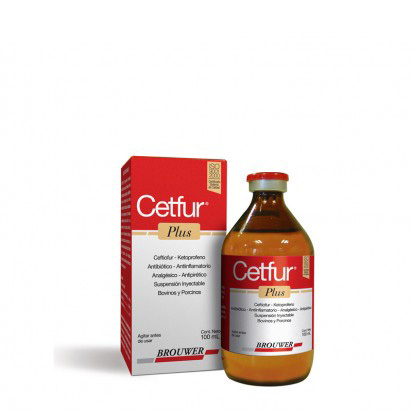 Antibiotic, anti-inflammatory, analgesic and antipyretic drug. Cattle: Bovinerespiratory disease (BRD), shipping feverorbovine pneumonia, acute interdigitalnecrobacillosis (foot-rot). Treatment and prevention of reproductive tract infections (metritis). Swine: Bacterialrespiratory illness. Treatment and prevention of reproductive tract infections (metritis). Sensitive bacteria: Salmonella cholerasuis; Actinobacillus pleuropneumoniae; Streptococcus suis type 2; Mannheimia (Pasterurella) haemolytica; Pasteurella multocida; Hystophilus somni (Haemophilus somnus); Haemophillus parasuis, Fusobacterium necrophorum; Bacteroides melaninogenicus; Moraxella bovis. The combination of drugs in this product is effective in the treatment of infectious or potentially infectious processes associated with pain and inflammation. Such processes include: acute and chronic laminitis, acute infectious mastitis, dystocia. This is also the product of choice in the immediate postoperative period (caesarean sections and other surgeries, such as dehorning of older calves).